Do not go running with someone that plays soccer on a team. Or better yet, anyone that plays soccer regularly. They can run, I…well, jog. Or you might even call it walking-incredibly-fast-where-you-kinda-have-to-jog, so you don’t trip. Then I’m doing this awkward half run/half trot and it’s just weird. Crumble cake into a large bowl and mix thoroughly with ½ cup cream cheese frosting (it may be easier to use hands to mix together). 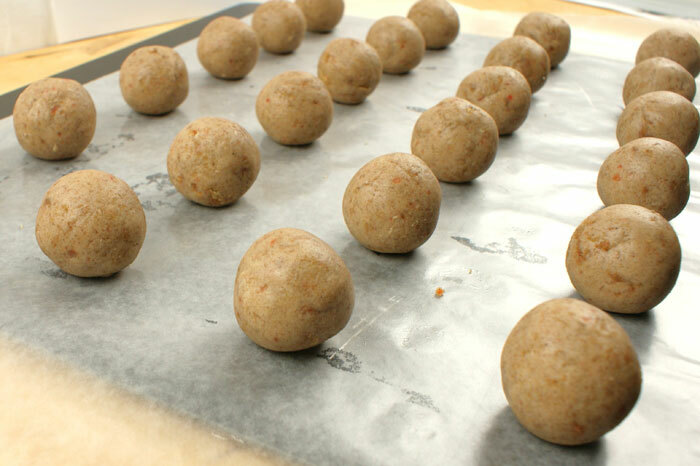 On a wax lined baking sheet, roll mixture into 1 inch balls. Melt 1 package of Vanilla CANDIQUIK at a time, according to the directions on the package. 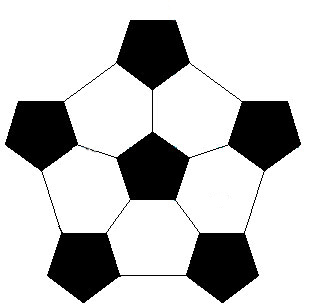 Once completely dry, use the edible marker to draw on the soccer ball design. To get perfectly sized cake balls, I use a stainless steel coffee scoop. A cookie dough ball scoop would also work. Print this picture out for a guide if it’ll help you! AmeriColor has other food markers, but make sure you buy the one that is labeled Gourmet Writer. 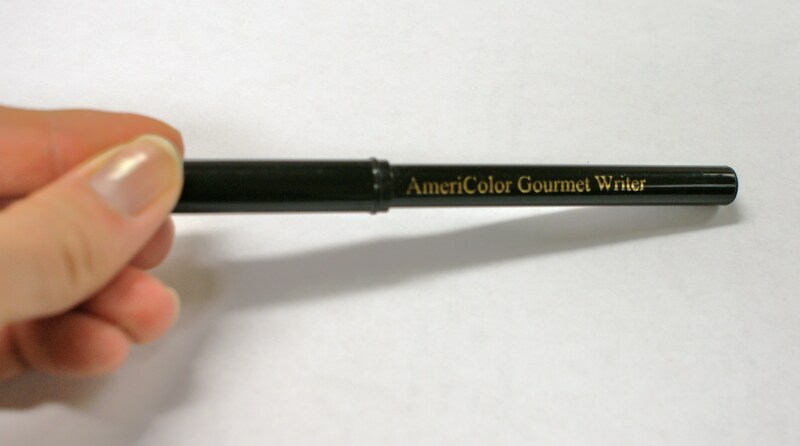 As I’m fairly certain Gourmet means “writes on just about everything”. I’ve experimented with other edible wrting pens (I think they were the Wilton brand) and I’m not sure what they write on – but they sure didn’t write on cake balls. Here are the deets: I purchased a 2 pack of these (online) for about eight bucks (shipping included). You can get them here. Or if you have a cool cake decorating store near you, try that. The more I think about it, maybe you should eat these before you go running. Instant sugar boost – maybe it’ll work for you!? Maybe running just isn’t my thing? Either way, happy baking. 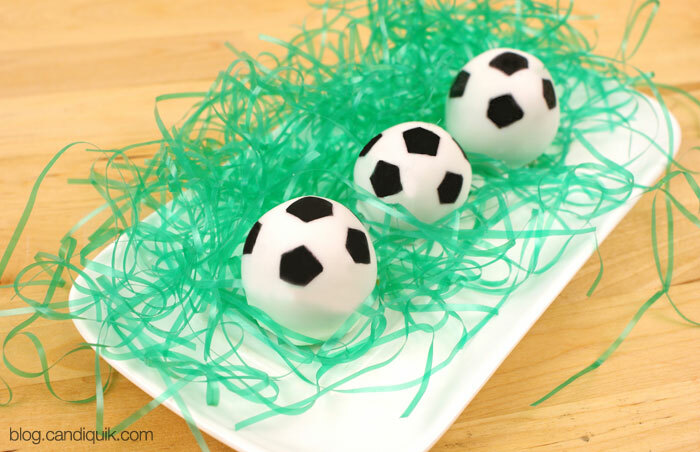 If you’ve never made cake balls or pops, I suggest you take a peek at my Cake Pop Tutorial. Make peace with cake pops.